The number of payday licenses will be capped at 212, which matches the number of provincially-licensed locations already operating in the city as of May 1, according to Toronto's municipal licensing and standards department. 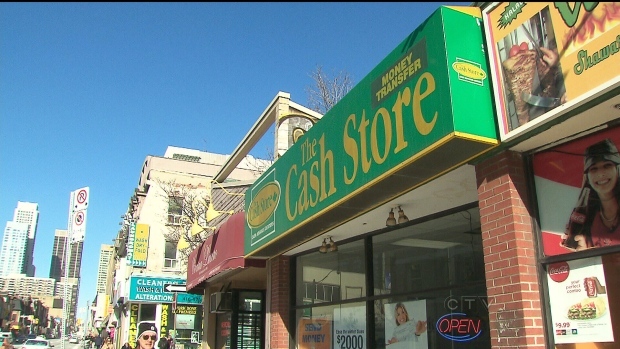 TORONTO -- Canada's largest city is the latest of a host of municipalities to crack down on payday lenders with bylaws to impose restrictions on their business activities and rein in the number of physical locations. The loan rates still far exceed Canada's criminal usury rate of 60 per cent interest when expressed annually, but because the loans are meant to be used to cover short-term expenses for a two-week period, the lenders do not express terms annually. However, many users end up carrying them for far longer than their next paycheque. Toronto city councillor Kristyn Wong-Tam, who has long pushed for more restrictions on payday lenders, said these businesses often prey on the most economically vulnerable and trap them in a "vicious cycle" of debt with high interest rates that make it nearly impossible to repay the loan. A licensing system will give municipal officials more control, she added. "Ultimately, what we want to do is reduce the number of payday lenders and try to cap some of the rates so people cannot be a victim of predatory lending," she said. In March, Hamilton city council adopted legislation to cap the number of payday loan outlets to 15, or one per ward, while city council in Belleville, Ont. adopted a councillor's resolution to study the possibility of limiting payday lenders' presence to three distinct zones. "That's certainly the challenge that we have," said Wong-Tam. "Much of the financing is also available online. And once it's online, how do you regulate something that doesn't have a physical address in Toronto?" Tony Irwin, CEO of the Canadian Consumer Finance Association, said its members understand the industry needs to be regulated, but these new rules seem like "duplication," with additional fees on top of the provincial fees. "What does that mean for the single mother who works two jobs but has a shortfall of income in a particular month and needs help?... Where will she go? The need doesn't go away." Irwin said most consumers typically turn to their physical locations to access payday loans, but people who don't have access to a physical store will simply find another option online, such as an unlicensed, offshore lender out of the reach of Canadian law enforcement. "The ultimate aim is the protect the consumer... Without ending and killing the business. There is a balance that needs to be struck there somehow."